Namo Buddha is a beautiful place. There is no need to exaggerate this. The place is very quiet and pure. Its environment is very clean, with no pollution, and the natural air is so fresh, cool and healthy. It is also the right place for meditation and practice. In the morning when you wake up, you can see a beautiful sunrise. In the evening you can see a wonderful sunset. You can enjoy snow-covered Himalayan ranges which look so amazing and pure. From the Buddhist point of view, Namo Buddha is one of the most important religious sites in Nepal. There are three major Buddhist pilgrimage sites: Boudha Stupa, Swayambhunath Stupa and Namo Buddha. Namo Buddha is about 40km away from the heart of Kathmandu city. It is in Kavre District in the southeast of the valley. If you take a local bus, it will take around 3 to 4 hours because there are several substations, but if you take a taxi from Kathmandu, it will take around 2 hours. It may cost about NRs1700-2000 for one way (KTM-NB) and NRs2500-3000 for a return trip (KTM-NB-KTM). If you are willing to take a local bus from Kathmandu, you should first go to Ratna Park Bus station, which also known as Old Bus Park (Puraano Bus Park). 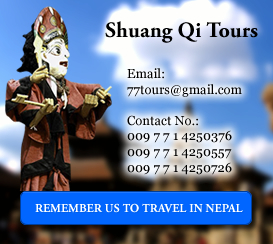 You can book a ticket and take a bus from there to Banepa. The bus goes through Koteshow then Bhaktapur and then finally reaches Banepa. From Banepa you have to change buses. Book a ticket at the counter for Namo Buddha (a bus which goes up to Dhapcha passes through Namo Buddha, so you can take that bus as well). The bus goes past the Dhulikhel bus station. There are local restaurants where you can order a meal if you come to Namo Budha for a day trip. You can stay longer in Namo Buddha as well. There are two guest houses at Thrangu Tashi Yangtse Monastery. 2. The other is newer and more comfortable. The basic guest house has single and double rooms. It is quiet, and the air is fresh and pure. The guests staying here are offered meals along with the monks. It is very nice having meals along with ordained Khenpos, Lamas, teachers and monks. The charge is only NRs.400 per guest which is comparatively cheap and affordable. The other guest house is bigger and more comfortable. There are 8 rooms and in each room, there are two comfortable beds. There is a garden surrounding the guest house as well. The charge is only NRs.800 per guest, including meals. You can have your meals with the monks or in the manager’s building, as you prefer. If you would like to stay at Namo Buddha in our guest house, you may either contact the manager Lama Tenzin Chophel directly (see contact) or contact the manager of Hotel Ngodrup (in Boudha, Kathmandu) and they will make all the arrangements. For more details check the official site.